Kobe Bryant upstaged Allen Iverson and received a rude reception from the Philadelphia crowd. Bryant, a native of the Philadelphia area, scored 31 points -- many amid a steady chorus of boos -- to lead the Western Conference to an easy 135-120 victory over the Eastern Conference in the 51st NBA All-Star Game. The game was supposed to be a showcase for Iverson, Philadelphia's star guard. But despite wearing Julius Erving's retired No. 6, Iverson was held to five points in his own building and never supplied the electricity that he did last season, when he won MVP honors. Bryant became the first player since Michael Jordan in 1993 to score 30 points in an All-Star Game. In the second half, he also became the target of bitter fans who remember Bryant's Los Angeles Lakers beating the 76ers in the NBA Finals last season. The city that once booed Santa Claus unleashed on Bryant in the second half, serenading him every time he touched the ball. The postgame ceremony in which NBA Commissioner David Stern awarded Bryant the MVP award was drowned out by the crowd. "I was pretty upset, pretty hurt," Bryant said. "I think it's a compliment, to be honest with you," West coach Don Nelson of Dallas said. Bryant, from nearby Lower Merion, has been dealing with this sort of treatment for awhile. "My rookie year, I came out of high school, my first game here, they booed me a little bit, too," he said. "And that really, really hurt, because it was like my homecoming. ... That was very, very hurtful." Bryant put a hurt on the East, which had won four of the last five All-Star Games. After passing up a potential winning shot in last year's game, Bryant didn't pass up much in this one. He was 12-of-25 from the field and extremely aggressive at the offensive end. "I'm happy I played well," Bryant said. "I'm happy to win MVP in Philadelphia, and the booing was just hurtful. But it's not going to ruin this day for me." "What an incredible performance he put on," Nelson said. "He was a step ahead of the best in the league, and you could see it. That's hard to do, because there were some great, great players out there." One of them was Seattle guard Gary Payton, who scored 18 points for the West. He was part of a 3-point barrage in the fourth quarter that told the East there would be no miracle comeback this year. The West made 13-of-30 shots from the arc, setting marks for both categories. In the final period, it made seven, including four in a row after the East reduced a 24-point deficit to 100-90 with 9:07 to go. 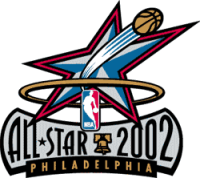 Iverson, who had scored 51 points in his first two All-Star Games, was remarkably quiet in this one. He came out passing and never got his breakneck offense untracked, making just 2-of-9 shots. Michael Jordan returned to the All-Star stage and had some moments early on, but missed a breakaway dunk late in the first quarter. "I laugh at myself," Jordan said. "If I can't laugh at myself, I can't laugh at anybody." All five East starters were stuck in single digits. Its best player was Orlando swingman Tracy McGrady, who scored 24 points off the bench and had one of the best dunks in All-Star history in the second quarter. "I remember when I used to be like that," Jordan said. "It's truly a great thing to see."